Quick note from me: I post my reviews from this site and the bead site to Amazon, as well as reviewing a lot of other things there. The last week I've been at 898 reviews, then today reviewed a set knitting needles to bring it up to 899 so this could be my 900th review. Simply because for that personal milestone, I wanted to review something truly special. This was it. 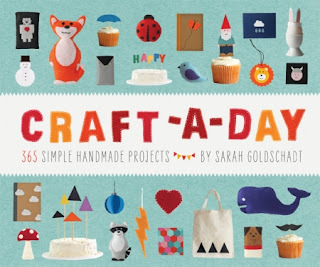 Craft-A-Day: 365 Simple Handmade Projects by Sarah Goldschadt lives up to it's title. The projects are simple. They don't take a big investment in time or materials. They fit into busy lives well, and are ideal for craft parties or crafting with young people. It's a lovely book, the projects are very well photographed, not crammed all together on the pages, at 426 full color pages, each project gets it's own page with well written instructions. They are charming and put me in mind of zakka type crafts from Japan, which makes sense. A lot of the zakka craft movement is inspired by Scandinavian crafts and the author of this volume draws a lot of her inspiration from the same background. Simple shapes, bright folk colors and easy techniques done well make simple projects. The style is a clean, bright appealing look. Or if I can stop being a grown up for a minute-It's so cute! I lovelovelovelove the projects in this book. She breaks down the year into weeks, and each week has a theme. Some of the themes are shapes, and she does clever things with just circles or squares. But a lot more of them are things. Animals, flowers, rainbows, mustaches, ghosts and trees for example. 52 weeks to the year, so 52 different themes. The projects come with complete instructions and templates you can trace or copy for patterns. For the sake of simplicity, the projects use similar construction methods which make it easy, you could work through this whole book in an hour or less a day every day for a year. The projects are very simple, and great for all level of crafters. Like I said above, it would be a great book to pick a project for a craft themed party with friends, or an evening with a young person. It's also got great quick projects that make fast gifts. Hand stitched felt stuffies, lots of cupcake toppers, card making projects, wall decor projects and jewelry projects. I didn't see a single project in the book that would cost more than 5 dollars to make, and since most of the projects use small amounts of materials, that 5 dollars would cover making a few of each. The projects are really cute, handmade looking, and charming. It's very current and DIY trendy. I have a friend who was telling me recently that she can't craft. I'm personally going to recommend this book to her. I'm also recommending this to a friend with a crafty daughter, I think they would enjoy this a lot together. I received a complimentary copy of this book to review, my reviews are always my personal and honest opinion. You can read more about my review policy here.